I am experiencing difficulties locating the Identification Document. Where can I locate it? I forgot to add my middle name on my application OR I have two last names, what should I do to make sure my application is submitted correctly? What should I do if my name changes prior to the exam? What if I have changes to my NCLEX registration information? My "NC Program Verified" checklist item is marked as incomplete; how do I update or provide this information? How long does it take to receive eligibility from the North Carolina Board of Nursing and Authorization to Test (ATT) from Pearson Vue? How many days will it take my license to post if I am successful? 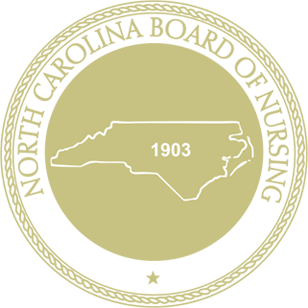 I reside in another compact state, can I apply for licensure in North Carolina? My Driver’s License is from another state, can I still test? Do I have to reside in North Carolina to apply for the NCLEX? What am I going to show my employer? They always want to see my license. I attend school in North Carolina but live in another state, which state should I apply to? I am currently a Deferred Action for Childhood Arrival (DACA) student, I would like to test and obtain licensure in North Carolina, is that possible? I am a graduate of an International Educated Nursing program, how can I obtain approval to test for NCLEX in North Carolina? How many times am I allowed to test? Can I challenge the NCLEX exam? Are there review courses for NCLEX? Effective March 1, 2019, the Identification Document is no longer required to test for the National Council Licensure Examination (NCLEX®) or gain licensure in North Carolina. The first and last name printed on your identification must match exactly the first and last name printed on their Authorization to Test (ATT) letter. If the name with which you registered is different from the name on your identification, you must bring legal name change documentation to the test center on the day of the test. Maiden/Middle names are optional and will not affect your ability to test or obtain licensure. Submit name change requests and supporting legal documents to the Examination Department (examdept@ncbon.com). Inform the North Carolina Board of Nursing Examination Department (examdept@ncbon.com), and the change-correction will be made. The information on your North Carolina application can be changed at any time, but the above identifying information must be provided. Program verification for North Carolina graduates will be provided to the North Carolina Board of Nursing by the Program Director within 30 days of program completion. Note: We are unable to expedite the Examination process. Licensure will usually post within 5 business days unless all Criminal Background Check requirements have not been fulfilled, if unsuccessful re-examination packets will be provided to candidates within 30 calendar days. North Carolina does not require residency to test for the NCLEX. When completing an application, you must provide honest and accurate responses. Primary State of Residence: The State in which a nurse declares a principal residence for legal purposes. Sources used to verify a nurse’s primary residence may include Driver’s License, Federal Income Tax Return, Military Form #2058 or Voter Registration. Candidates are not required to be a resident of North Carolina to test for North Carolina. All information provided on the application to the North Carolina Board of Nursing & Pearson Vue should match what is on your current Driver’s License. If living in a Compact State, candidates are required to provide proof of residency to North Carolina Board of Nursing within 90 days of successfully completing the NCLEX to avoid inactive licensure status. Interested candidates do not have to reside in North Carolina to obtain North Carolina licensure. All out-of-state applicants must provide the Board with an official copy of the final transcript. Your employer can access your licensure information directly from the Board of Nursing database, which is the primary source for nurse licensure information. An out-of-state candidate does have the option to complete testing in the state they currently live in or the state in which they plan to work. Each state's guidelines, requirements, and policies do vary. Currently, all DACA students are eligible to apply and test for NCLEX upon successful completion of member Board approved nursing education program. North Carolina does not require residency or citizenship as a requirement for testing and obtaining licensure. Future changes in legislation could impact North Carolina's ability to issue licensure for DACA students. For additional information, contact uscis.gov. Effective October 1, 1997, in accordance with U.S. Title 42 U.S.C. 405 et al and Section 343 of Public Law 104-208 (1996) and North Carolina General Statute 93 B-14, individuals, foreign graduates or otherwise, who are seeking licensure by examination must have a valid Social Security number to be issued a license to practice nursing. The North Carolina Board of Nursing does require a Criminal Background check before a license can be issued, but it is not required for you to be eligible to apply for and take the NCLEX. For additional information, contact Candice Moore at candicem@ncbon.com. To access the instructional guide, visit Internationally Educated Applicants. Testing attempts are currently unlimited. The North Carolina Board of Nursing does not allow any challenges (including Military Corpsmen and those that partially completed a Registered Nurse program) to the Board for eligibility to apply for the National Council Licensure Examination (NCLEX). To be eligible to apply for the NCLEX-PN, you must have completed an approved Practical Nursing Education program. The North Carolina Board of Nursing does not offer review courses, study guides or other test prep help. You may also contact your school of nursing to seek additional guidance.